The food court at Century City mall is one of the best. It may have some chains, but it is a long way from the fast food filled food courts of the world. Strangely, there is some turnover in restaurants, but they always seem to be replaced by a similar restaurant with the same name. 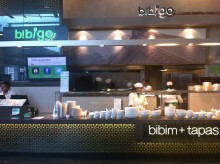 Case in point: Sorabal, a Korean place, was replaced by Bibigo, a – you guessed it – Korean place. Sure, Bibigo is a different concept from Sorabal, but my point still stands. 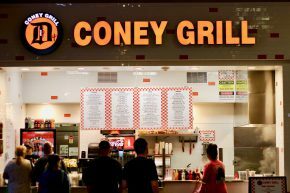 It’s not too often that food court food gains critical acclaim. Yet, in the case of 101 Noodle Express (my favorite college course), the only reason I went was by recommendation from Jonathan Gold. Like KyoChon, 101 Noodle Express can be found at the Fox Hills Mall, but also in other places where you would expect it more – like the San Gabriel Valley. Almost as surprising as finding such a place in a food court is the fact that Gold doesn’t even recommend the noodles. A few more veggies than I bargained for. In the heart of LA’s Fashion District is a relatively new, yet relatively hidden food court. 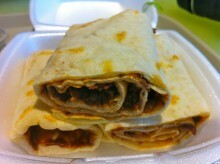 It is here that you can find a nice variety of foods and kind of escape after eating at one too many taco trucks. The food court itself is outdoors and feels like a world away from the fashion peddlers below. You can find Korean, Mexican and sandwiches up here, but I was pretty much drawn to a Japanese place called Blosom Bento. 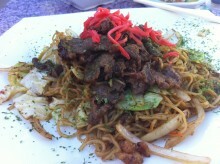 Sure, they served sushi, but they also had my favorite Japanese dish of all time on their menu: Yaki Soba. 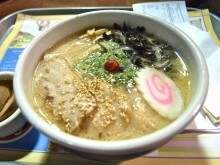 Not too long ago (at least in my head), Ajisen Ramen opened its doors at the Century City food court. I’m not sure where else this Japanese ramen chain exists in the US, but I do know it is a pretty popular and slightly upscale chain in the land of Asia. I decided to check it out to see how it held up against its Asian brethren and found that the menu was pretty similar to what I remembered from Asia. 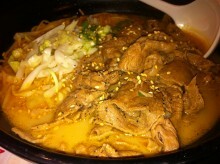 It had a variety of ramen options and some tasty-looking Japanese appetizers. 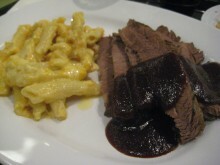 EDIT: The Century City location is gone, but Lawry’s continues to carve elsewhere. 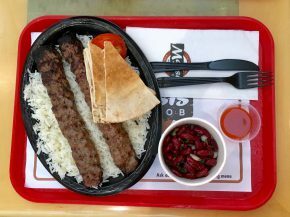 After a year or so of flirting around with the Asian options at the Century City food court, I finally decided to take the plunge into some of their meatier food. This is not to say that I wasn’t eating meat all along, but few restaurants exude meatiness more than Lawry’s Carvery, the food court version of Lawry’s Prime Rib steakhouse. I took to browsing their menu and even though there was a ton of meat, a few of the good-looking dishes included vegetables.